﻿ Little Saigon Boutique Hotel, Ho Chi Minh City | FROM $24 - SAVE ON AGODA! 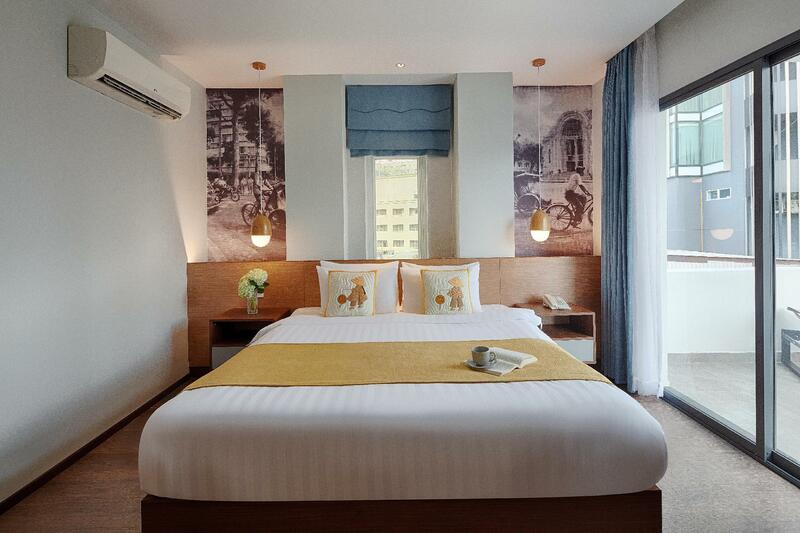 Have a question for Little Saigon Boutique Hotel? "Reception staff speaks good English and give us suggestion for good local food." "Staff is very helpful and friendly." 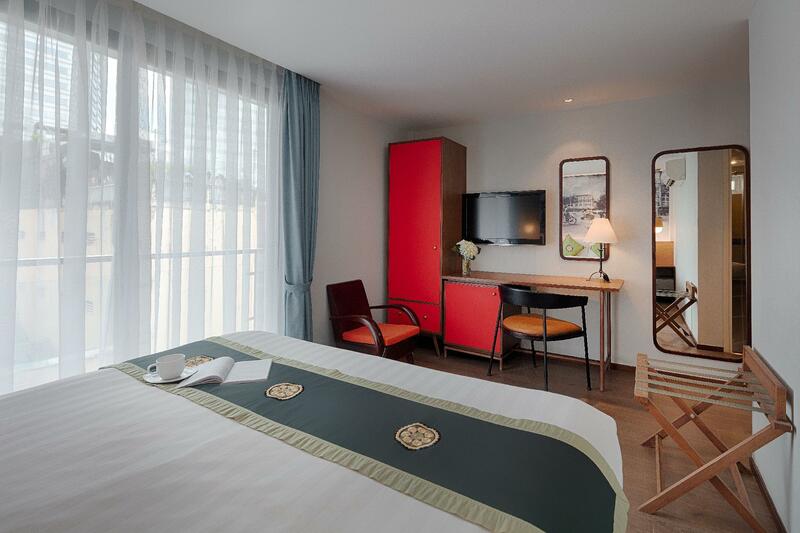 "all in all, a great boutique hotel that I would definitely return to!" "Staff were friendly, including the housekeeping lady." Have the vacation of your dreams at the Little Saigon Boutique Hotel. The hotel has air conditioning, so your stay will be comfortable. It is near Viet Thanh Silk, Authentique Home, Tam Silk, Elegant Silk, and Ipa-nima. 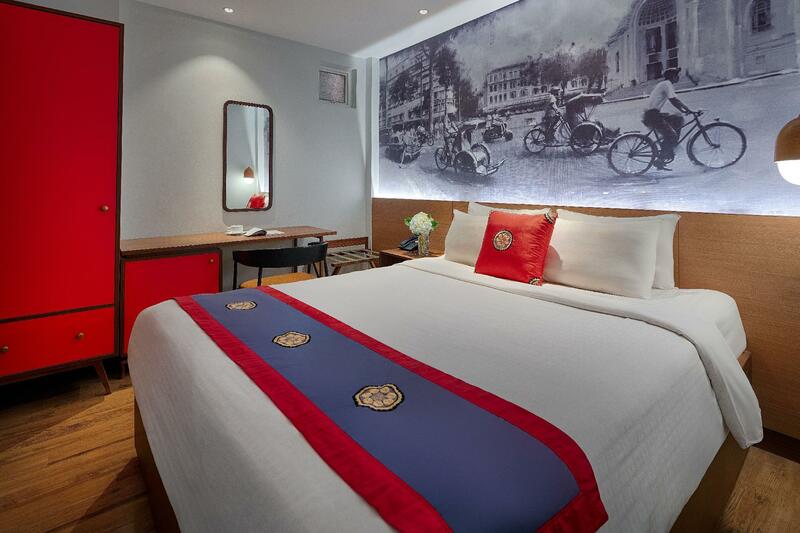 The Little Saigon Boutique Hotel has several convenient features, such as safety deposit boxes, a currency exchange, an infirmary, a variety of shops, as well as a smoking area. Featuring a garden and ticket services, it is fully equipped to ensure that your vacation will be as memorable as can be. 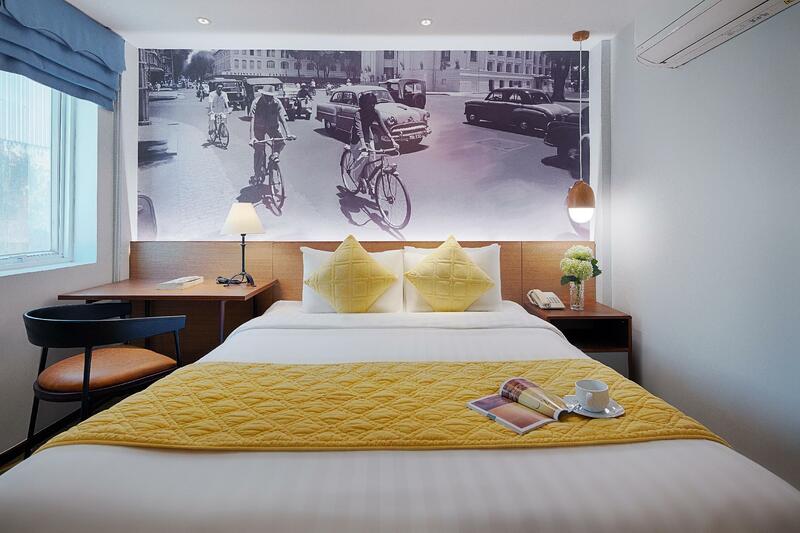 The Little Saigon Boutique Hotel offers city views from its rooms, giving you a glimpse of the busy city roads. Offering guided tours, the Little Saigon Boutique Hotel is the perfect place to stay to learn about your surroundings and see everything you can while you're here. The hotel has a bar, restaurants on-site, and room service, so you can choose to stay in or grab a snack. With Vietnamese, American, and Asian restaurants nearby, it is in an ideal area for those who want to enjoy delicious cuisines when eating out. Have a tasty meal at Ham Nghi Quan, Bun thit nuong, Cung Dinh, Corso Steakhouse & Bar, Chuck's Burgers or other local eateries. From a concierge to laundry services, it has numerous useful services to ensure that you get the most out of your time in District 1. The Little Saigon Boutique Hotel gives you access to numerous transport options, such as airport transfers, shuttle services, bicycle rentals, and car rentals. The Little Saigon Boutique Hotel offers check-in from 02:00 PM and check-out until 12:00 PM. This hotel provides free Wi-Fi in all rooms, as well as Wi-Fi in common areas, ensuring that guests are able to contact their friends and family. It provides an express check in and check out service, enabling you to avoid the frustration of waiting in slow-moving queues when readying yourself to catch a train or plane back home. The Little Saigon Boutique Hotel has an around-the-clock front desk, so there is always someone around to answer any questions. With pet-friendly facilities, it is perfect for guests who can't bear to part with their pets. The Little Saigon Boutique Hotel features a kids club, offering parents a secure childcare option to keep their children happy. The nearest airports are Tan Son Nhat International Airport (SGN) and Long Thanh International Airport, which are located 6 km and 25.3 km away. Saigon Railway Station is 2.7 km away and Ben Xe Mien Dong Bus Station is 4.6 km away. "Very clean, modern, comfortable rooms." Exceptionally friendly and helpful staff. A decent breakfast and the location is perfect to see Ho Chi Minh, being 10 minutes walk from the Saigon Tower and the War Remnants Museum. Also because it’s in the middle of a block of buildings it’s totally hidden from the traffic noise outside which we’ve found to be a real sleep killer throughout Vietnam. Highly recommend! I enjoyed my one night here, staff is friendly and helpful. The location is in the heart of district 1 (city center) so is good location for tourists. But if you have a lot of luggage you need to map the location out before you go, since its down a hem (alley) at the end. My grab driver dropped me off at the main road and I was kind of stranded with three large suitcases but I called and the hotel sent a staff member to find me and help me with the luggage. I was on the 5th floor, room with a balcony but some of the rooms don't have windows so be sure to double check when you book. Unfortunately the lift was under repair for 24 hours - I was on the 5th floor! However, the room is comfortable and well enough appointed, the bathroom clean with good shower and the breakfast in the cafe pleasant (if the coffee is freshly made!) The staff are outstanding in their friendliness and willingness to help. The location close to the Rex hotel but hidden down a little lane, providing a quiet haven away from the usual noise and traffic, is excellent. Altogether, albeit not cheap, a good choice. This is a good small hotel, but at the moment they are struck by road work in front and renovation inside. So for the moment; I will recommend to find other location - but in the future; I'm sure it's as good as it used to be! Our cab driver had a little trouble finding the hotel as it is tucked away behind a construction fence. Once we spent our night and experienced their wonderful breakfast it changed our minds. The location is close to many of the tourist spots that you want to visit. Very quiet in the evening. The staff are amazing!! Would recommend to anyone travelling and wanting to stay in district 1. Pros: location! Perfect spot in district 1. Walking distance to a lot of sites. Great breakfast. Super clean room. Friendly staff. Amazing staff who helped out with everything. Even helping us to get a taxi with our luggage. Although centrally located by the market it is down a very quiet side street with very little noise at night. Rooms were very clean and had everything we needed. Breakfast was great with plenty of choice. I would definitely stay here again mostly because of the staff. It was my first trip to Vietnam and being a solo female traveler, I had decided to try out this hotel due to its centralized location (easily accessible to landmarks but also quiet enough to sleep at night). Every staff was friendly and helped me with getting a taxi to my desired locations and recommending places that I could visit. Will love to thank this female staff in particular (long black hair and she’s really tall), great way to start each morning with her morning greetings at the lobby. One thing to note though, the hotel is tucked deep in from a narrow dark alley, but I have never feel unsafe walking through, even at wee hours after drinking. 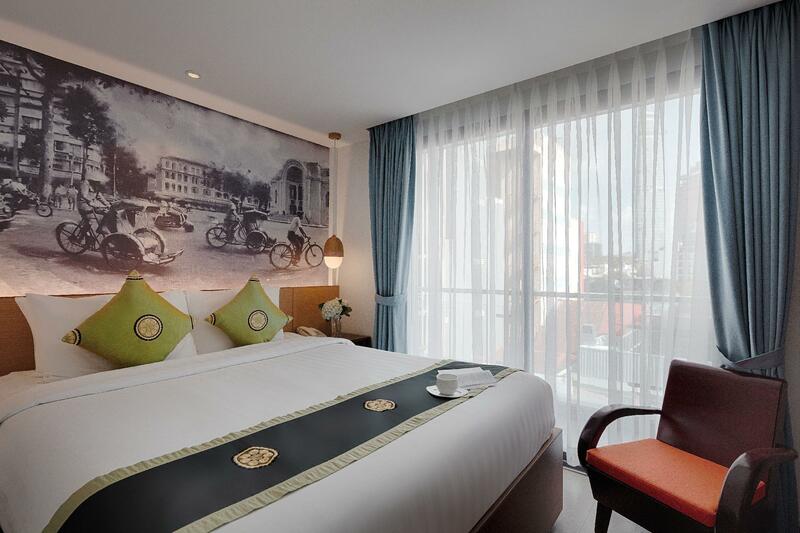 The hotel is located in a peacefull and quiet place in the middle of Saigon. It is easy to go around from this location. In the next building you can find a nice and reasonably priced top roof restaurant. Worth to visit. We liked really a lot of the ambient athmosphare of this small homy hotel with nice personnel. We stayed here for 2 nights. The hotel is lovely. Located at the end of an street ( alley) which had lots of little shops. Great comfy bed, staff very helpful and only a few minutes walk away from the main areas of town. We would return. Very clean, modern, comfortable rooms. Situated in a small courtyard at the end of an atmospheric alleyway, the hotel is an oasis in a madhouse. It's also perfectly situated between Ben Thanh market and the more modern parts of central Ho Chi Minh, walkable (if you like walking) to the Presidential Palace and the War Museum. A great spot if you're looking to be away from the seedier/grimy tourist area, which is about 1km walk away. Also, a shout out to the cleaning lady that not only does a great job, but must be the sweetest cleaning lady we've ever met. Staff were great, honest, and run the place well. They have a beautifully quaint breakfast eating area at the bottom of the hotel, but the breakfast maybe could do with a little more thought. I'd suggest offering some fresh Vietnamese rolls to put some of their eggs on, which tended to be our breakfast staple in Vietnam as a Westerner. But all in all, a great boutique hotel that I would definitely return to! We arrived late night, there is a construction in main road, no light and as we need to go along the alley, at the 1st we missed the sign, but it only took us 5 mins to get back in to the track. But as the location is a little bit inside number of building, hidden away from the road, we do have a nice quite night. Bed is very comfy. staff are lovely, we got upgrade room too!! nice simple breakfast available. No complaint at all with this property. It’s an older hotel but quite nice. The rooms are smallish but clean. There are some rooms so understand which kind you are getting. The breakfast is fair at best but it was decent food. The staff is wonderful. Kelly especially was so helpful. We stayed at Little hotels in Hoi An. There is no comparison. We booked Little Saigon not realizing it was part of the same group. This hotel has a long ways to go to reach that level. If I am correct this location is scheduled for renovations. My husband & I escaped our first hotel horror check in by booking this one in our room & walking there! When we arrived, we already felt better. They we welcoming, offered us an upgrade for a fraction of the advertised price & carried our bags into the lift. Our Porter opened our door, turned on the AC & completed a mini turn down service!! It was only 4pm, but it was the thought that counts & we certainly appreciated it! We loved it so much, we extended our stay by 2 nights. Our room was the perfect size for the 2 of us, with a tv, fridge, built in robe & a really well pressured hot shower. Surprised by the silk like robes & slippers provided!! As well as the laundry service available for a very reasonable price. The breakfast was delicious. All of the staff always smiled & said hello & our room was lovingly cleaned every day. It was off the main street, so you could only hear a whisper of the crazy street noise, but we were still in walking distance to just about anything, and we walked alot!! Also, just around the corner from the market & some delicious places to eat! We will definitely, definitely stay again!!! Staff was very friendly. Good central location also the room was simple and clean and at affordable rates. The Little Saigon Boutique Hotel is in a great location in a small alley in District 1. It's clean and quite alright for a couple of nights but overall is looking rather tired. As is often the case with these small hotels in Saigon there's no fire escape. Overall I feel there are a lot of Airbnbs now that are probably a better choice than the Little Saigon Boutique Hotel. 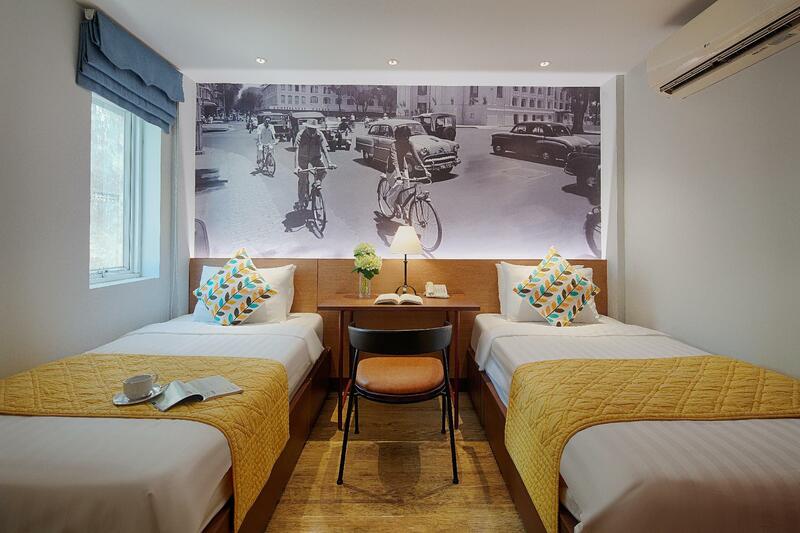 Small hotel in between an alley between Saigon Center (luxury high end mall) and Ben Thanh Market. Quiet location. Small but simple rooms. Didn't woke up in time for the breakfast. Overpriced private hotel transport from the airport at $22 usd, wouldn't recommend after finding how cheap Uber and Grab are in Saigon.